Have you ever heard someone say that God has really been “showing them” something? Have you ever thought to yourself, “what the heck is that person talking about?” I’ve had several people tell me that God has been showing them something, and every time I hear it, I think…what? How? How do you know it’s God? Is God showing ME something and I’m totally missing it, because I have no idea how to listen to or look for God? It’s one of those things I used to dismiss as someone over-thinking a couple of random coincidences…or maybe even as just a figure of speech that doesn’t really mean anything, even to the person saying it. However, I have recently changed my mind. I do actually think that God has been trying to show me something lately, and I think it’s because I’ve been praying about the exact thing that he’s been showing me. I think that because I’ve been asking God specifically to show me how I can be a better person – the best version of myself (don’t you like that idea? I read that in a book somewhere, and I like the sound of it) – he has put me in situations where I can see my shortcomings more clearly and practice being…better. So what has God revealed to me? That I am a crappy friend. Yes, it’s true. I am a really lame friend. The kind that you wouldn’t even know is your friend, because she’s never around when you need her and never calls you or even texts you and possibly even avoids making eye contact with you at the store because she doesn’t want to start a conversation with you because she feels guilty because she knows she’s a bad friend. And I don’t think I’m alone, here. I think there are a lot of us who are great wives and mothers and sisters and daughters, but we completely neglect being a good friend and fail to seek out other women to become friends with. And God has shown me that there are all kinds of people around me – young women, older women, many of them moms – who desperately need friendship. Reconnecting with a couple of old friends who are going through some seriously tough times (without any support from me) has forced me to be honest with myself about the kind of friend I typically am. So what kind of friend am I? I’m the kind of friend who always says no when you ask if I can do something with you, unless it’s at my house or your house and I can bring all of the kids. I’m the kind of friend who never calls or texts you back, because I get so caught up in whatever I’m doing that I forget about it for days, and then I feel guilty about not getting back to you, so I just pretend to myself that you never contacted me in the first place. I’m the kind of friend who says things like, “We need to get together soon!” and then does absolutely nothing to try to make that happen. I’m the kind of friend who would never think of telling you something you don’t want to hear, even when you really need it, because my need to be liked is stronger than my need to help you. I’m the kind of friend who gets freaked out when you’re going through hard times and uses the excuse that “you need some time and space to sort things out” as a reason to avoid you when you need me the most. I’m the kind of friend who assumes that you are going to reach out to me when you need a friend, and that meanwhile I’ll just do my own thing and wait for that to happen. Why Am I So Bad at Friendship??? I think that, as moms, we give so much to our families that we think we just don’t have anything left for anyone else. I know that for me, it can be so physically and emotionally draining to take care of my kids all day that by the time my husband gets off work and I could theoretically do something with a friend, the thought of interacting with even one more person is overwhelming. I dread the sound of the phone or doorbell ringing, and I can’t even imagine going somewhere where other people might want to have a conversation with me. In my mind, “having friends” is something that I did when I was a kid and young adult. My ideas about how to be a friend and what friends do are all from 20 years ago, when friendship was about partying all night, and spending hours together studying, and shopping, and lounging around all day in pajamas. Having friends was all about how much fun we could have together, and being a good friend meant being able to entertain someone. The best kind of friends were the ones who made you laugh the most, or who threw the best parties, or who always had something fun planned for the weekend. When I look at it through that lens, having friends doesn’t make any sense anymore. I can’t go and spend hours doing something “fun” with someone – my house is a mess and I have a thousand errands to run! I can’t party all night – I need to sleep or I’ll be a zombie for days! I can’t be fun or entertaining…unless you’re a 6-month-old who loves peek-a-boo and Dr. Seuss. At the end of the day, even with seven kids at home, I could take 15 minutes to call a friend and give her some encouragement. On a Saturday morning, I could go out for coffee with a friend and be home before all the kids are even awake. I could write out a quick greeting on a card and pop it in the mail while I’m waiting for the kids at school, or piano lessons, or gymnastics. I have more than enough time, love, energy, and “me” to give to a friend – to lots of friends. I think we all do, and we all need to do a better job of being there for each other. 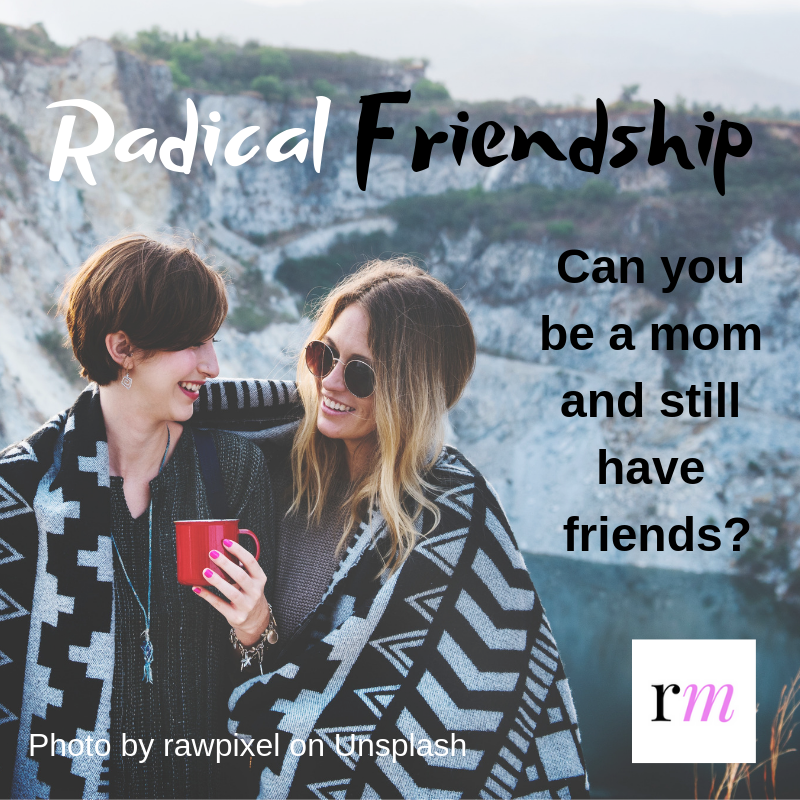 Have you been neglecting your friendships too? What’s one thing you could do this week to make or rekindle a friendship? Subscribe Now and Get These Awesome FREEBIES!